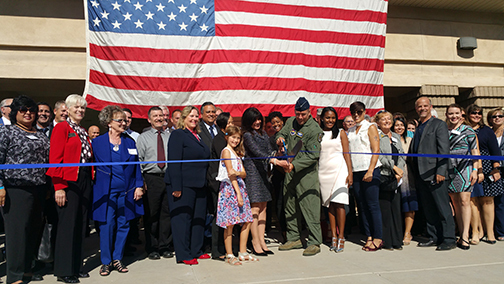 Rio Salado College | RioNews: New Military & Vets Success Center at Luke AFB! New Military & Vets Success Center at Luke AFB! Arizona Governor Doug Ducey issued a proclamation today to commemorate the new Military and Veterans Success Center - West at Luke Air Force Base in Glendale, AZ-- the nation’s first community supported, case-managed, holistic support center for transitioning military, veterans and their spouses. “The support from multiple state agencies including the Department of Corrections and the Department of Veterans’ Services demonstrates our belief in this new model as a better pathway,” states the proclamation, which was read by Arizona Department of Veterans' Services Public Information Officer Nicole Baker, during a ribbon-cutting ceremony and open house hosted by the Maricopa Community Colleges, Rio Salado College and Luke Air Force Base. 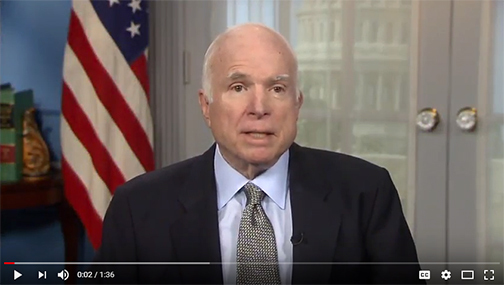 “I want to thank Chancellor Harper-Marinick and the Community College District for helping Arizona lead the country in supporting our transitioning military, veterans and spouses,” said Senator John McCain, during a message recorded for event attendees, which included community partners and local media. “Our District is committed to our veterans, not simply by offering educational pursuits for students utilizing their G.I. Benefits, but by supporting any transitioning military, veteran or spouse,” said Chancellor Maria Harper-Marinick during ceremony opening remarks. If unprepared, transitioning out of the military can be a challenging and confusing adjustment. Within 30-days, military members and their families may lose employment and housing, their support systems, sense of place and identity. It’s not that there aren’t resources available, in fact there are more than 40,000 organizations supporting military and veterans nationwide, however, the awareness of these resources is lacking. That’s the big gap the Military and Veterans Success Center plans to narrow. "Enabling our Airmen to grow while on active duty and setting them up for success as they transition from active duty is something we emphasize daily,” said Luke AFB commander Brigadier General Brook J. Leonard, who was among the presenters at the event. “The Military and Veteran Success Center will support this effort in amazing ways for the 5,600 Airmen at Luke and the nearly 450 that transition out of Luke and into our community and others across America each year. We are proud of the partnership that this center represents, combining Air Force programs at Luke with the resources of our incredible community for a more seamless transition in education and employment opportunities for our men, women and their families." The Military and Veterans Success Center will serve as a one-stop-shop to bridge resources to military members and their spouses, to help them transition smoothly and successfully into civilian life. Case managers will help individuals create success plans that incorporate all facets of their lives. The center will also help individuals seek funding through the Maricopa Community Colleges Foundation for scholarships, books, tuition, housing, resume writing, financial literacy, transitional classes, child care and emergency needs. Event attendees toured the center, which is located near the Luke AFB Lightning Gate entrance. It is one of two centers hosted by Rio Salado College that will provide free services to military families transitioning to civilian life in Maricopa County. The other center, known as the East Valley Veterans Center in Tempe, AZ will begin offering specialized transition programs in coming months. “This center will support our hero community by giving them resources, sometimes years before they leave the military, that holistically develops a personal plan for success; financial, career, and family,” said District 8 Congressman Trent Franks. Students enrolled in Rio Salado’s Incarcerated Re-Entry classes at Arizona Department of Corrections facilities played a key role in the center’s construction. Federal and local agencies and community partners were instrumental in getting the initiative funded. 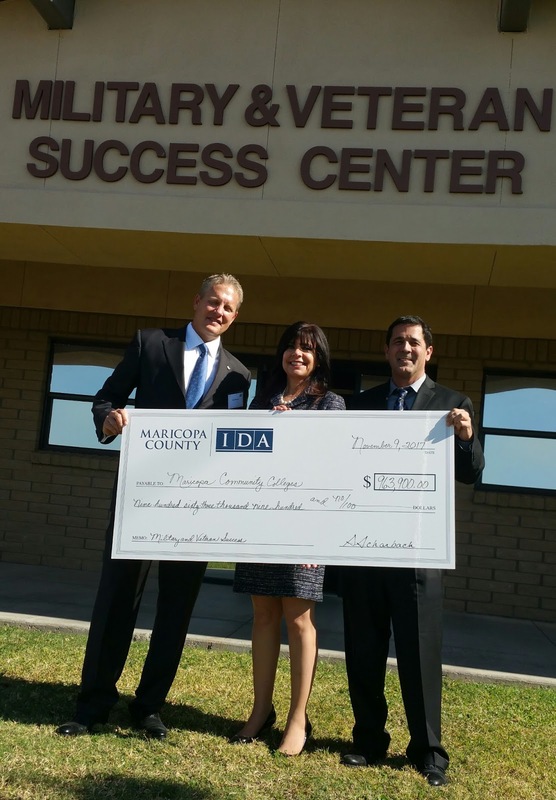 “Maricopa County and our Industrial Development Authority has contributed almost a million dollars to support these centers with the latest technology that gets our veterans working as quickly as possible,” said District 4 Supervisor Clint Hickman. To learn more about this initiative, visit: https://mcccdf.org/fundraising/veteran-success-project. Photos courtesy of MCTV Director René Blatté. Photo 1: Group photo with Luke AFB commander Brigadier General Leonard and Chancellor Harper-Marinick leading ribbon-cutting ceremony. Photo 2 features Business Development Officer for the Maricopa County Industrial Development Authority Gregg Ghelfi, Chancellor Harper-Marinick and District 4 Supervisor Clint Hickman.